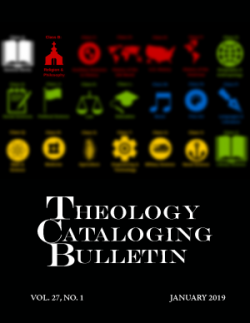 Established in 1992 as a members-only publication, the latest issue of the Theology Cataloging Bulletin was published in January on the OJS platform as an open access journal. In addition to lists of new and changed LCC and LC Headings as well as professional development opportunities, this issue contains a bibliography of articles on linked data and another on classification and subject headings. January’s Testimony author is Michael Bradford. He has written an essay on the work he has done to catalog church newsletters and discusses the value of these unique resources to research. Additionally, he has included a survey about hidden serial collections. Because it is now freely available on the internet, this publication can be easily shared with colleagues so feel free to pass the link along https://serials.atla.com/tcb/index. Many thanks to section editors Ann Heinrichs and Anna Appleman, ATLA staff Christine Fruin and Tawny Burgess, and student member of the ATLA Press Coordinating Council Race MoChridhe for all their contributions to facilitating the launch of TCB as an open access journal.